This is very good news. I do believe that the Moon should be the first destination that we colonize, but with funding at the levels they are at the moment it makes sense to first choose a destination that is both easier and also completely new, in order to ignite a sense of wonder about space among the public that seems to have been lost through far too much time in LEO alone. A mission to an asteroid would also technically be the farthest manned mission from the Earth, so a new record there as well. The reasons for a manned asteroid mission are quite simple: they are close enough that a mission would only take a few weeks, they are as yet unexplored, and their gravity is nearly nonexistent which removes a lot of the hassle that would be involved in a place like the Moon - no landing gear needed, no second rocket to break the gravity of the body needed, rotation speed of these bodies is generally pretty normal so there would be a more standard day and night cycle instead of a maximum of 10 or so days before it begins to get dark and the long night begins, etc. 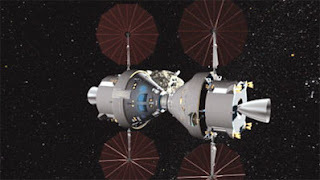 The configuration is quite a simple one - just take two Orion modules and link them together. These linked spacecraft would then orbit an asteroid at a very close distance while astronauts somehow made their way to the surface to explore (not sure how this would be accomplished). The biggest hurdles with an asteroid are keeping a secure foothold on the surface, and perhaps dust on the surface that could be attracted by static electricity. Picking an asteroid that seems to be fairly solid (as opposed to a rubble pile) would be a good idea for both of these.